Seems babies are popping up all over in my daughters' lives, as well as my husband's office. I'd forgotten how much fun it is to knit baby hats. No pattern neccessary, just wing it: On the left is a simple meandering cable which looked far too plain for a little girl named BLUE. A little felted flower added just the right girly touch. The Irish cap next to Blue's hat is for a little girl named RUE. (I'm not kidding here folks) It seems Rue has an Irish Daddy, so the cable is borrowed from an Alice Starmore sweater called Inishman. 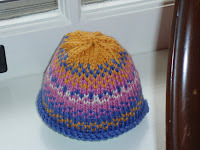 The other hats were made long ago and given away, but it was fun to bring them together so that my other daughter could send samples to another new mother on the west coast, so that she can choose a style, color, etc. that suits her little girl SIDNIE?